The latest SPOT (Spectacle Populaire Ouvert à Tous) at the Théâtre de l’Étang in St Estève is a performance by the Argelès Gospel Singers, accompanied by a discussion between artistes and the public. 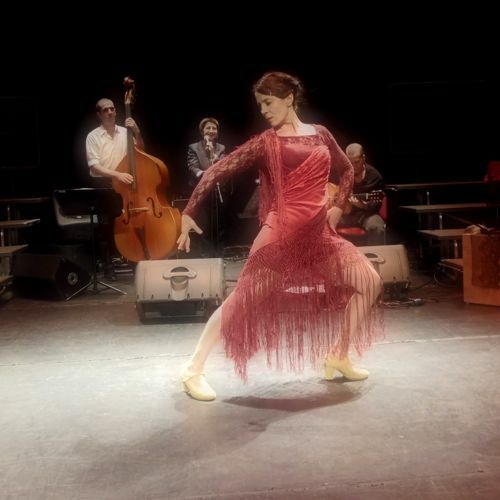 For their new show “Entre deux rives” the Trio Sensible invite Sandra Diaz, flamenco dancer, to give another dimension to their journey from the other side of the Atlantic Ocean, to the Andalusian soul! Latin songs, mix of styles, the Trio is like a spark that feeds the heat of Latin American music, Argentina in particular. Deeply marked by the culture of Buenos Aires, through the voice of Violeta Duarte, native Argentinian, who sings with an insatiable energy, the style is also jazz, blues, rock and flamenco, with Thierry Lopez guitar and Francis Adam on bass. This intimate journey is the result of the friendship between three lovers of music and life.